1776 - During the American Revolution, the Continental brig, Reprisal, commanded by Capt. Lambert Wickes, transports the newly appointed commercial and naval agent, William Bingham, to Martinique. While en route, the British sloop-of-war, HMS Shark, approaches the brig at the entrance to St. Pierre Harbor. After a sharp encounter and inconclusive action, HMS Shark withdraws and Reprisal enters port. 1862 - During the Civil War, the side-wheel steamer, USS Yankee, commanded by William Gibson, and the side-wheel tug, USS Satellite, commanded by Master Amos Foster, capture schooner J.W. Sturges in Chippoak Creek, Va.
1917 - Construction of the Naval Aircraft Factory, Philadelphia is ordered to produce enough aircraft for Americas entry into World War I. The factory also introduces women into occupations that were previously only open to men. Following the war, the factory tests and manufactures aircraft to review costs and effectiveness. During the later stages of World War II, the air craft factory is disestablished. 1943 - USS Scamp (SS 277) torpedoes and sinks the Japanese submarine (I 168), which had sunk USS Yorktown (CV 5) and USS Hammann (DD 412) at the Battle of Midway, south-south-west of Truk. USS Scamp also damages the Japanese oiler, Kazahaya. 1953 - The Korean War armistice is signed at Panmunjon, Korea. The Korean cease-fire goes into effect at 22:00. 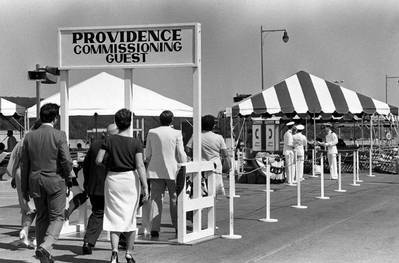 1985 - USS Providence (SSN 719) is commissioned at Groton, Conn., the fifth ship in the Navy to be named after the Rhode Island city.